ATHENS • As the Greek crisis proceeds to its next stage, Germany, Greece and the triumvirate of the International Monetary Fund (IMF), the European Central Bank and the European Commission (now better known as the troika) have all faced serious criticism. While there is plenty of blame to share, we shouldn't lose sight of what is really going on. I've been watching this Greek tragedy closely for five years, engaged with those on all sides. Having spent the last week in Athens talking to ordinary citizens, young and old, as well as current and past officials, I've come to the view that this is about far more than just Greece and the euro. Some of the basic laws demanded by the troika deal with taxes and expenditures and the balance between the two, and some deal with the rules and regulations affecting specific markets. What is striking about the new programme (called "the third memorandum") is that on both scores, it makes no sense either for Greece or for its creditors. As I read the details, I had a sense of deja vu. As chief economist of the World Bank in the late 1990s, I saw first-hand in East Asia the devastating effects of the programmes imposed on the countries that had turned to the IMF for help. This resulted not just from austerity but also from so-called structural reforms, where too often the IMF was duped into imposing demands that favoured one special interest relative to others. There were hundreds of conditions, some little, some big, many irrelevant, some good, some outright wrong, and most missing the big changes that were really required. Back in 1998 in Indonesia, I saw how the IMF ruined that country's banking system. I recall the picture of Mr Michel Camdessus, managing director of the IMF at the time, standing over President Suharto as Indonesia surrendered its economic sovereignty. At a meeting in Kuala Lumpur in December 1997, I warned that there would be bloodshed in the streets within six months; the riots broke out five months later in Jakarta and elsewhere in Indonesia. Both before and after the crisis in East Asia, and those in Africa and in Latin America (most recently, in Argentina), these programmes failed, turning downturns into recessions, recessions into depressions. I had thought that the lesson from these failures had been well learnt, so it came as a surprise that Europe, beginning a half-decade ago, would impose this same stiff and ineffective programme on one of its own. Whether or not the programme is well implemented, it will lead to unsustainable levels of debt, just as a similar approach did in Argentina: The macro policies demanded by the troika will lead to a deeper Greek depression. That's why the IMF's current managing director, Ms Christine Lagarde, said that there needs to be what is euphemistically called "debt restructuring" - that is, in one way or another, a write-off of a significant portion of the debt. The troika programme is thus incoherent: The Germans say there is to be no debt write-off and that the IMF must be part of the programme. But the IMF cannot participate in a programme in which debt levels are unsustainable, and Greece's debts are unsustainable. Austerity is largely to blame for Greece's current depression - a decline of gross domestic product of 25 per cent since 2008, an unemployment rate of 25 per cent and a youth unemployment rate twice that. But this new programme ratchets the pressure up still further: a target of 3.5 per cent primary budget surplus by 2018 (up from around 1 per cent this year). Now, if the targets are not met, as they almost surely won't be because of the design of the programme itself, additional doses of austerity become automatic. The high unemployment rate will drive down wages, but the troika does not seem satisfied by the pace of the lowering of Greeks' standard of living. The third memorandum also demands the "modernisation" of collective bargaining, which means weakening unions by replacing industry-level bargaining. None of this makes sense even from the perspective of the creditors. It's like a 19th-century debtors' prison. Just as imprisoned debtors could not make the income to repay, the deepening depression in Greece will make it less and less able to repay. Structural reforms are needed, just as they were in Indonesia, but too many that are being demanded have little to do with attacking the real problems Greece faces. The rationale behind many of the key structural reforms has not been explained well, either to the Greek public or to economists trying to understand them. In the absence of such an explanation, there is a widespread belief here in Greece that special interests, in and out of the country, are using the troika to get what they could not have obtained by more democratic processes. Consider the case of milk. Greeks enjoy their fresh milk, produced locally and delivered quickly. But Dutch and other European milk producers would like to increase sales by having their milk, transported over long distances and far less fresh, appear to be just as fresh as the local product. Last year, the troika forced Greece to drop the label "fresh" on its truly fresh milk and extend allowable shelf life. Now it is demanding the removal of the five-day shelf-life rule for pasteurised milk altogether. Under these conditions, large-scale producers believe they can trounce Greece's small-scale producers. In theory, Greek consumers would benefit from the lower prices, even if they suffered from lower quality. In practice, the new retail market is far from competitive, and early indications are that the lower prices were largely not passed on to consumers. My own research has long focused on the importance of information and how firms often try to take advantage of the lack of information. This is just another instance. One underlying problem in Greece, in both its economy and its politics, is the role of a group of wealthy people who control key sectors, including banks and the media, collectively referred to as the Greek oligarchs. They are the ones who resisted the changes that Mr George Papandreou, the former prime minister, tried to introduce to increase transparency and to force greater compliance with a more progressive tax structure. The important reforms that would curb the Greek oligarchs are largely left off the agenda - not a surprise since the troika has at times in the past seemed to have been on their side. As it became clear early on in the crisis that the Greek banks would have to be recapitalised, it made sense to demand voting shares for the Greek government. This was necessary to ensure that politically influenced lending, including to the oligarchic media, be stopped. When such connected lending resumed - even to media companies that on strictly commercial terms should not have got loans - the troika turned a blind eye. It has also been quiescent as proposals were put forward to roll back the important initiatives of the Papandreou government on transparency and e-government, which dramatically lowered drug prices and put a damper on nepotism. Normally, the IMF warns of the dangers of high taxation. Yet, in Greece, the troika has insisted on high effective tax rates, even at very low income levels. All recent Greek governments have recognised the importance of increasing tax revenues, but mistaken tax policy can help destroy an economy. In an economy where the financial system is not functioning well, where small and medium-sized enterprises can't get access to credit, the troika is demanding that Greek firms, including mom-and- pop stores, pay all of their taxes ahead of time, at the beginning of the year, before they have earned it, before they even know what their income is going to be. The requirement is intended to reduce tax evasion but, in the circumstances in which Greece finds itself, it destroys small business and increases resentment of both the government and the troika. This requirement seems at odds, too, with another of the demands with which Greece has been confronted: that it eliminate its cross-border withholding tax, which is the withholding tax on money sent from Greece to foreign investors. Such withholding taxes are a feature of good tax systems in countries like Canada and are a critical part of tax collection. Evidently, it is less important to ensure that foreigners pay their taxes than that Greeks do. There are many other strange features of the bailout packages, in part because each member of the troika has its favourite medicine. As doctors warn, there can be dangerous interactions. The battle, however, is not just about Greece. It's not even just about the money, although special interests in the rest of Europe and some within Greece itself have taken advantage of the troika to push their own interests, at the expense of ordinary Greek citizens and the country's overall economy. This is something I saw repeatedly first-hand when I was at the World Bank, most noticeably in Indonesia. When a country is down, there is all manner of mischief that can be done. But these policy debates are really about ideology and power. And we understand that this is not just an academic debate between the left and the right. Some on the right focus on the political battle: The harsh conditions imposed on the left-wing Syriza government should be a warning to any in Europe about what might happen to them should they push back. Some focus on the economic battle: the opportunity to impose on Greece an economic framework that could not have been adopted any other way. I believe strongly that the policies being imposed will not work, that they will result in depression without end, unacceptable levels of unemployment and ever-growing inequality. But I also believe strongly in democratic processes - that the way to achieve whatever framework one thinks is good for the economy is through persuasion, not compulsion. The force of ideas is so much against what is being inflicted on and demanded of Greece. Austerity is contractionary; inclusive capitalism - the antithesis of what the troika is creating - is the only way to create shared and sustainable prosperity. 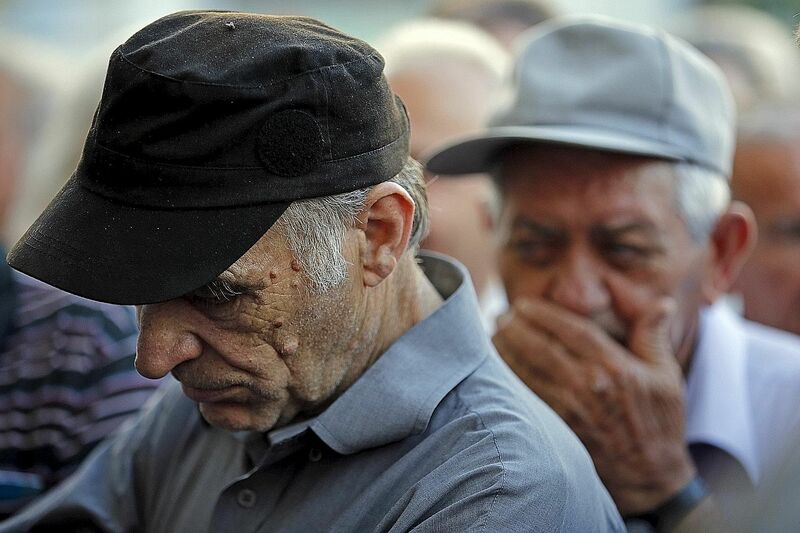 For now, the Greek government has capitulated. Perhaps, as the lost half-decade becomes the lost decade, as the politics gets uglier, as the evidence mounts that these policies have failed, the troika will come to its senses. Greece needs debt restructuring, better structural reforms and more reasonable primary budget surplus targets. More likely than not, though, the troika will do what it has done for the last five years: Blame the victim.